I found the Indians retiring, though still firing, and pursued them for some distance towards their camp, when as night was falling and they were fully repulsed and the policy was not to bring on an engagement, I returned. Colonel and brevet Major General Eugene Asa Carr was the sixty-year-old commander of the 6th Cavalry Regiment and had held that position for a dozen years. During the Civil War Carr had been distinguished with five brevet promotions through major general and a rare promotion to brigadier general in the U.S. Volunteers for distinguished services at the battle of Pea Ridge, action for which he was eventually awarded a Medal of Honor in 1894. Up to the time of the Pine Ridge Campaign of 1890-1891, his regiment had served continuously for the previous fourteen years in the Department of Arizona. Six soldiers of his regiment ultimately were awarded Medals of Honor for actions at Grass Creek on New Year’s Day, 1891, based on the recommendation of Colonel Carr. The regiment’s deployment to Pine Ridge and associated tribulations were all the greater because the movement was a permanent change of station and involved the travel of families and personal property in addition to troopers, horses and equipage. Carr submitted his campaign report to Brigadier General John R. Brooke toward the end of April while on leave in New York City. Assistant Adjutant General, Department of the Platte, Omaha, Nebraska. Sir: Circumstances have prevented my making, heretofore, a detailed report of the services of my command during the recent Sioux campaign, of which I now respectfully submit the following narrative. On Sunday, November 23, 1890, I received at Fort Wingate, New Mexico, from Brig. Gen. A. McD. McCook, commanding the Department of Arizona, who was then at Fort Union, N.M., a dispatch stating that my regiment, the Sixth Cavalry, was relieved from duty in his department and assigned to the Department of the Platte, and to report the day and hour field officers and troops at Fort Wingate could be ready to move. I reported that we could be ready in ten days, perhaps sooner. We were in fact on the trains on the seventh day thereafter, December the first. This order came like a clap of thunder out of a clear sky. We had made our calculations and preparations for winter. Among others the storing of our winter vegetables. Our gardens at Fort Wingate being exceptionally good, and cultivated with great labor and care, had furnished a fine store for the benefit of the soldiers, which had to be sacrificed. I telegraphed for further information, and, several days later, was informed that the families of officers could remain at Fort Wingate till the stations of the regiment should become known, but both they and the soldiers’ families would not stay, and, in fact, could not with any comfort. We therefore packed all of our regimental, company, household, and other private property, in seven days. Through want of energy at department headquarters, the commanding general being absent, no orders were given for the paymaster to come to Wingate, but we paid the command at Albuquerque while we were watering and feeding the horses and giving the men their coffee. My regimental quartermaster was unable to obtain his receipts for the post quartermaster’s and subsistence property till all was counted over by his successor, and I was therefore deprived of his services for three weeks of the most difficult part of the campaign; my adjutant was inexperienced, though most attentive, and I was consequently obliged to attend to a great part of the staff duty myself. There were few travel rations at Wingate, no provisions being kept on hand for such a movement, and bread had to be baked and beeves slaughtered and cooked. Much of the beef so cooked spoiled and was wasted en-route. Flour was also taken and exchanged for fresh bread at railroad towns. November 28 a dispatch was received suspending the movement till further orders, but directing command to be held in readiness. December 1, at 12:25, midnight, order was received to move at once. In an hour the wagons were lumbering about the post taking up property, and all were at the station before the cars were ready. The Palace Cars furnished for the horses proved unsatisfactory, in that it was impossible to water them without the water overflowing and wetting their legs and the floors of the cars. This would freeze, making the latter slippery and involving danger of falling and rheumatism. Had my former and persistent recommendations concerning stock cars been heeded it would, in my opinion, have conduced, not only to comfort of the animals and the efficiency of the services, but to economy as well, in saving valuable animals injured and lost through want of proper accomodations [sic]. After fairly trying the plan of watering and feeding in the cars, I concluded to unload at suitable intervals, and did so at Denver and other points, and am happy to say that only one horse was injured, who slipped his stifle and had to be left behind. At Denver Captain Lafayette E. Campbell, assistant quartermaster, showed us every attention; had the horses unloaded and fed by the railroad employes, and obtained passes for the wives and children of officers and soldiers who had previously been called upon for fares for transportation and sleeping. Omaha, Neb., December 5, 1890. Colonel Carr, Sixth Cavalry, (On special train en-route from Denver to Fort Meade, Report delivery). Julesburg, Colorado. M.V. Sheridan, Assistant Adjutant General. I communicated it to the families on the trains but none chose to accept such cold comfort, which would also have involved the extra expense, much greater than to pay board, of traveling to those places and afterwards to the posts to which assigned, which turned out to be Forts Niobrara and McKinney, the latter at a very great distance from the posts offered, and both back over the same road. Indorsement on telegram dated Headquarters Division of the Missouri, Chicago, Illinois, December 3, 1890, in which the division commander recommends that the Quartermaster’s Department be authorized and directed to hire quarters for the officers and married soldiers, that may be found the most expedient anywhere in the vicinity of the command. This in view of the fact that several regiments have been ordered to the division and a strong force will be needed there in the future to hold and control the Sioux Indians, and as suitable quarters are not available at posts. Respectfully returned to the Major General Commanding the Army. In the opinion of the Quartermaster General the authority herein requested should not be granted. The troops now away from their posts and operating against the Indians are considered to be in the field; they have full allowance of tentage, and officers and married men should share the privations and inconveniences of the whole command. Neither the law nor regulations contemplate the hire or commutation of quarters for officers or enlisted men on such service, and the state of the appropriation will not admit of it. R. N. Batchelder, Quartermaster General, U.S.A.
Official copy respectfully furnished Maj. Gen. N. A. Miles, U.S. Army, Commanding Division of the Missouri, in connection with the telegram to him of December 3, last, whereby he was informed that the families of officers of the Sixth Cavalry were authorized to remain at their present posts in Arizona until further stations should be made known. J. C. Kelton, Adjutant General. A. G. Office, December 9, 1890. Official copy respectfully referred to the information of the Commanding General Department of Dakota. H. C. Corbin, Assistant Adjutant General. I understand very well that it was impracticable for the Quartermaster General to give commutations; but it seemed only fair to emphasize the hardships of my regiment, which was the only one ordered to change station. The Seventh, Eighth, and Ninth Cavalry, the First, Second, Seventh, Eighth and Seventeenth Infantry, the troops from Leavenworth, and the Artillery, all retained their quarters, and left their families in them, and returned to them after the campaign was over. And I have not been told that the General and Staff Officers relinquished their commutations at their station, though all were provided with tents or shelter of some kind during all or part of the time while in the field. The adjutant general remarks that the families of officers of the Sixth Cavalry were authorized to remain at their present posts in Arizona until further stations should be made known. This was not received till after we were partly packed. It was most inconvenient, even for those stationed at Stanton, Union and Lewis, where part of the old garrison remained with whom the families were acquainted, but for those of my post, to be garrisoned by strangers, who wanted and were entitled to their choice of quarters, and who had been moved from their old, it was particularly hard. My last letter from Fort McKinney, Wyoming, the present station of three troops, states that their household goods have not yet arrived, nearly six months from the date of the order to change station, and they are living in bare quarters with camp or borrowed bedding, &c.
I do not bring this subject forward at this time in a carping spirit, or to complain that others are more comfortable than we, but to place on record for future consideration this among the other hardships undergone by the Sixth Cavalry in the past sixteen years. My commands seem to be in demand for service, for I had similar experience with the Fifth Cavalry which I commanded in 1876, when Crook would have it “for temporary duty,” and then would not let it go nor send an officer to ship our stuff from Fort Hayes to Fort McPherson. On the 7th I received a telegram to stop at Rapid City and encamp awaiting instructions, and on Monday, December 9, we arrived there, having started on the first from the farther border of New Mexico west of the Continental divide, and traversed the States of Colorado, Kansas and Nebraska, going east almost to Omaha; then north and west again almost to Wyoming, and stopping at the foot of the Black Hills of Dakota where I had campaigned in 1876. I had, by frequent telegrams, kept General Brooke informed of my whereabouts and strength in case he had need of my services. But the first orders I received were from General Ruger. He had sent directions to Fort Meade causing Lieut. Eugene A. Ellis, 8th Cavalry, to look out a camp for me at Rapid City and to meet me at Oelrichs. I desire here to express my thanks, and those of my regiment, to that officer for his care and attention, particularly in furnishing supplies, and in caring for the families of my officers and soldiers at Fort Meade. Also to Dr. McGillycuddy of Rapid City for courtesies there. Also states, “The first immediate duty for yourself and command, nothing intervening requiring other action, will be to see that no parties of Sioux Indians, particularly from Pine Ridge, commit depredations or roam about among the settlements along the Cheyenne River; taking in the region in particular from Battle Creek to Big Box Elder. Captain Carr with four troops is at Oelrichs. Captain Wells with two troops and two companies on Cheyenne six miles from Belle Fourche. It is expected that a company of Cheyenne scouts under Lieutenant Casey may be sent you” (me). These scouts never joined, and I was obliged to depend on guides and scouts picked up in the country, upon maps, and upon myself and my own men, for information, scouting and expressing. My former experience in such regions was here of value. I sent Maj. David Perry with Troops E and G, Sixth Cavalry, December 10, to the neighborhood of the mouth of Battle Creek, about forty miles distant, with orders to prevent parties of Sioux Indians from committing depredations or roaming about among the settlements along the Cheyenne River. I now sent to Fort Meade the instruments of the Band and took the men along to perform troopers duty. Division Commander says, should the hostile element break up you may expect that several of the principal ones will endeavor to escape; therefore direct your troops to take such precautions as will anticipate and intercept any small bands attempting to get away; you (I) will be vigilant, and make such disposition of your (my) force as may serve to intercept any parties attempting to escape. The part of the country as far north as Buffalo Gap the commanding officer Oelrichs will especially look after; that part from Buffalo Gap to Battle Creek Captain Wells, or whoever may be in command of troops in vicinity of Buffalo Gap, will especially look after. The commanding officer Sixth Cavalry will especially look after country along the Cheyenne River from Battle creek to ground covered by Lieutenant Colonel Sumner’s command near Smithville, and will dispatch officer with force from his command at Rapid City to take position for duty stated. It is not, of course, intended that the range of movement by the troops shall be confined to ground west of Cheyenne River…. 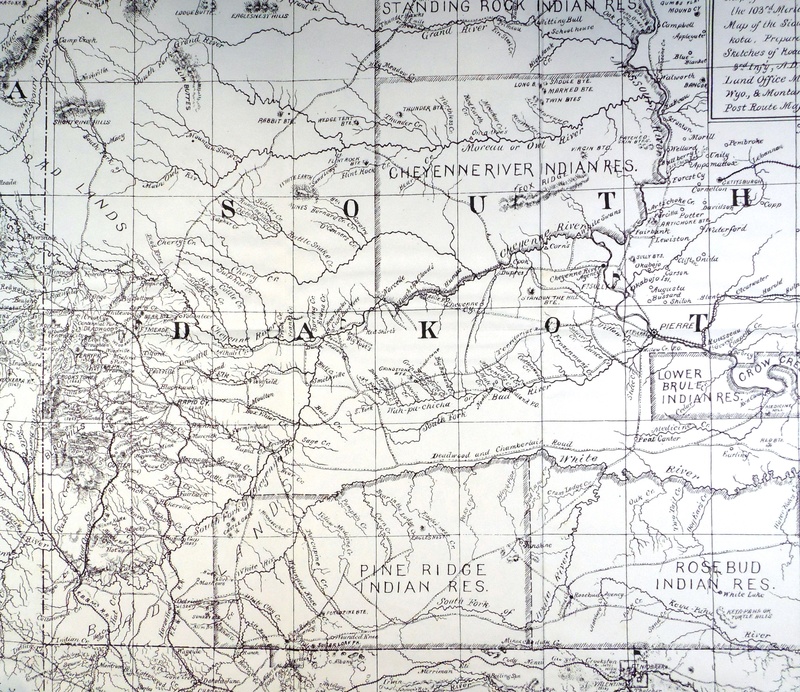 (Click to enlarge) Section of “Map of the Pine Ridge & Rosebud Indian Reservations and Adjacent Territory,” prepared by the Department of the Platte Engineer Office from 1890 authorities. Pursuant to the above I sent Maj. T. C. Tupper with Troops A, I and E, Sixth Cavalry, towards the mouth of Box Elder Creek. Thus my command in three days from arrival at Rapid City was divided into three detachments about forty miles apart. I had been, and was, busily occupied in fitting it for the field; getting the winter clothing, tents, transportation, guides, &c., &c.
December 14, 1890, 9:25 a.m. Colonel Carr, Rapid City, S.D. The Indians in Bad Lands refuse to permit the Indians sent from here to approach their camp. Would advise keeping your troops in as large bodies as possible. Scouts report an intention to attack your troops this morning; the signal being to fire the grass, which has been done. They number about 100, and will undoubtedly be recruited here. Will have more positive information this morning. Have advised Colonel Sanford. Can you not cover the Deadwood and Chamberlain road to east of the Cheyenne, this would prevent escape to north. I may send Seventh Cavalry against Indians to-morrow, and want you to move in from the north if I do. Arrange to have telegram sent after you by special courier so that an attack may be decisive if made. I am only waiting positive information as to Two Strikes’ movements, and from the camp in Bad Lands, which I hope to get to-day. Let me have any information you may get. Jno. R. Brooke, Brigadier General. I sent Troop D in advance with orders to cross the Cheyenne and cover this road. Arriving at the mouth of Rapid Creek, Creston P.O., I found that Troop D had been unable to cross the Cheyenne on account of ice, but I soon found a crossing for them. I had also sent ahead two soldiers with very explicit instructions to go to the mouth of Rapid Creek and then follow the Cheyenne valley up till they found Major Perry and deliver to him my orders to join. He had reported to me that he would be eight or twelve miles above the mouth of Rapid. These men returned without reaching Major Perry, stating that they could not find him, but being no doubt affected by the alarming rumors all through the country. I reproached them for their want of resolution, and they subsequently preformed good military service. These incidents indicate the state of tension of feeling all through that region and the uselessness of expecting soldiers to do express work. I then employed a young man who was in charge of the store and post office at Creston, who delivered my orders to Major Perry and he rejoined me next day. My regiment was frequently dispersed and concentrated as above during the campaign of six weeks, or twelve weeks counting from the starting from three posts in New Mexico, one in Colorado, to their final stations in Nebraska and Wyoming. A report came of an Indian having been killed by watchers at Cole’s ranch about five miles up the Cheyenne. Mrs. Cole and her daughter, just budding into womanhood, were the only females in that whole region who had not left their homes. Miss Cole had burst into tears of anger and mortification and positively refused when urged to leave her home. She had subsequently mounted her horse and carried a message to another ranch where the men were afraid to go. She is fit to be the wife of a soldier and the mother of heroes. A party of men had gathered there and were in the stable, when an Indian, afterwards identified as Dead Hand, tried to steal the horses. He crawled into the yard and might easily have got away with three animals, but, not satisfied, tried the stable door. He was sufficiently civilized to possess a box of matches, one of which he struck to find the latch. This exposed him to those inside who fired and filled his head and shoulders with buck shot. Dr. McGillycuddy recognized him as an Indian who had been baptized by Bishop Hare. He usually bore a cross on his breast, but on this occasion he had wrapped around him several lariats, as being more useful in leading away the horses he hoped to steal. I mention this incident as part of the narrative and not to throw any discredit upon efforts to Christianize and civilize the Indians, which have resulted in great good, and particularly with these very Indians, whom I was fighting only fourteen years previously when they were unmitigated savages. Although another Indian attempted to, and some did, steal horses from, and commit other depredations upon, the ranches along the Cheyenne, this is the only one killed whose body was secured. He was recognized also by the Indian wife of Mr. Farnam, who said he was her cousin, and who performed the customary ceremony of crying over the corpse. General Miles had informed me that he understood that this Farnam was in full sympathy with the hostiles. He had a ranch across the Cheyenne below the mouth of Rapid, and I notified him that if he staid there I would be obliged to place a guard at the ranch, but that he might return to Rapid City. He replied that he stood on his rights as an American citizen, but afterwards came to camp to see me and compromised on remaining at the Post Office where he was under sufficient surveillance to prevent any information going from his family to the hostiles. He said “I thought we were civilized,” meaning his Indian family, and that he and they should be trusted, and showed me a letter from his daughter who was at the school at Pine Ridge, well written and giving an account of the excitement there, and of the departure of the Indians for the Stronghold. This Stronghold, which was now our “Objective Point,” will no doubt receive the necessary attention in the report of the Commanding General of the Department of the Platte. It was described to me as a mesa or table land with precipitous sides, partly wooded, with several springs, accessible by one narrow wagon road and only two or three trails. It was S.E. and opposite the mouth of Battle Creek, about twelve miles distant from the Cheyenne River. I, of course, gathered all possible information concerning it, and studied incessantly the problem of attack. Besides my communications from Captain Wells, Eighth Cavalry, and reports from Major Perry of my command, I was in constant communication with Colonel H. M. Day, aide to the Governor of South Dakota, and other State officers, who were doing all possible to protect and re-assure the settlers. I was receiving orders direct from Brigadier Generals Ruger and Brooke, and Major General Miles, who had established his headquarters at Rapid City, all of which I obeyed to the best of my ability. Their purport being to prevent, at all hazards, the passing of Sioux Indians to the north or south across a line at least seventy five miles long, the two bodies of hostiles being nearly or quite a hundred miles apart; to prevent the junction of Big Foot’s band with the others, and to capture or destroy him if encountered. The duties imposed, although flattering to myself and my regiment, were exceedingly onerous upon nine small troops of about 50 men each, without Infantry or scouts. But we did prevent the junction; forcing Big Foot so far to the east that the ample force at Pine Ridge Agency intervened. Lieutenant Colonel Offley, Seventeenth Infantry, arrived at my camp December 27, with one company of his regiment and a Hotchkiss revolving cannon which had broken its pintle coming down a hill. This was fixed with a chain obtained from a farmer who came to me for pay. There being no appropriation applicable I believe it was considered in the hay. Lieutenant Colonel Offley had Captain Roberts’ company, Seventeenth Infantry, which he expected to take with him up the Cheyenne, but having been notified by General Miles that I was to have a company of that regiment, I ordered him to stay with me. Captain Carter’s troop, Sixth Cavalry, with Lieutenant Colonel Morrow, who had been left sick, had come in on 20th to 21st and with them Lieutenant Cronkhite with two Mountain Hotchkiss guns. The horses with these guns were unshod, their feet were tender, and the first request I received was for the cavalry blacksmith to shoe them. They were also without pack saddles or mules which I was obliged to provide as well as possible from the transportation of the troops. General Brooke had formulated a plan for the attack of the Stronghold which he sent to me, but the Indians at Pine Ridge Agency wanted to make another effort to induce the hostiles to come in, and it was suspended. Meantime Sitting Bull was killed and some of his followers joined Big Foot’s band of Cherry Creek, north of Belle Fourche. I was ordered December 15 from Saint Paul to look out both ways, and prevent a junction between the bands, and to communicate with Lieut. Col. E. V. Sumner, Eighth Cavalry, who had three troops, two companies and scouts below Smithville on the Cheyenne near the mouth of Belle Fourche. I was authorized by General Brooke to send any necessary orders to Captain Wells at Oelrichs and the mouth of Battle Creek, and by General Miles to give any orders to Lieutenant Colonel Sumner; but I saw nothing to do unless to move them from their stations, which was not contemplated by the Generals. I sent, December 20, a battalion under Major Emil Adam, Sixth Cavalry, to the eastward to go down to White River to the neighborhood of the mouth of “Bear in Lodge” Creek, about forty miles distant, to protect the settlers and intercept Indians going north or south. The final effect of this movement, together with my scout to the Pinnacle and Bull Creek, was to throw Big Foot’s band so far east that they did not form junction with the others. It appears that Lieutenant Colonel Sumner reported that he had captured Big Foot; at least orders were sent to him through me to bring him to the railroad, to Fort Meade, or to my camp. He had not, however, reduced him to possession, and when he started to do so the bird had flown. He sent me the following which I received December 24th after 10 a.m.
Near Big Foot’s village, S.D. Colonel E. A. Carr, Rapid City, S.D. Big Foot did not come into my camp to-day as promised and I started for him this afternoon. His lookouts of course let him know that I was on the road. He sent me word by messenger that he would go to Fort Bennett to-morrow with all his people, but when I approached his village I found it vacant, and my scouts have informed me that he has gone up Deep Fork Trail, due south, that he will probably pass Mexican Ed’s and head of Bull Creek near the Bad Lands. If you can move out to-morrow morning (a force) you will doubtless intercept him. They had yesterday a hundred fighting men, and about three hundred altogether including women and children. They started from here in very light order, no wagons, all had ponies and will travel very fast. For fear they may return here I will stay here to-night, scout up Deep Creek to-morrow, and if I hear nothing will start for Smithville and go out Bull Creek towards Bad Lands. Dispatches from General Miles relative to Indians coming from the north and west of me in considerable numbers prevent my following the trail and getting out of reach. I hope you will get this in time and you will head them off. Lieut. Col. 8th Cavalry, Commanding Camp. Received 10 a.m. Dec. 24, 1890. In the Field, Camp mouth of Rapid Creek, S.D. Respectfully forwarded to General Miles. I am starting with all troops here to cut the trail. One troop out patrolling and four troops go with me. E. A. Carr, Colonel Sixth Cavalry, Commanding. I feared that Big Foot had already passed, but sounded “boots and saddles” at once, and with the four troops in camp and the two Hotchkiss guns, was off in half an hour without waiting to pack provisions, blankets or tents. The nearest trail or road by which he could travel was twelve miles east of me, the next twenty miles. My best guide was an old man named Americus Thompson, who lived there, but was half dazed and left me that night without leave. However I held towards the east and arrived at the first road (which is the old Fur Company’s road from Laramie to Pierre) at 12:30. There were no signs of the passage of such a band as that of Big Foot, and I continued on to the other road, being obliged to make some detours in the Bad Lands which I there struck for the first time. They are nothing in comparison with the rocky and inhospitable regions of Arizona and New Mexico, nor so difficult as the mountains of the Big Horn or deserts of Western Texas and the Indian Territory, in all of which I have served. They consist of a deposit of a soft sediment, which after the secession of the bodies of water, has been washed by ages of rain fall into ravines and gulches, leaving fantastic bluffs and so called walls which offer some, but not great, impediment to travel. They are mostly covered with grass, though bare in places, and I found water frequently, though it is more or less alkaline. I reached the second road before dark and found that Big Foot had not passed there. Leaving a hidden picket near this road I retired a mile or two to a valley which I had crossed, one of the heads of Sage Creek, and went into camp, that is, unsaddled and picketed the horses, and prepared to take what rest was possible, sending also a picket back to the other road where there was a house. During the night the first picket reported signal flashes, which on investigation proved to be the opening and closing of the door of the house where the second picket had a fire. Two troops which had been on detached service joined during the night with four guides, one of which I sent to the south east through Sage Creek Gap, with information and orders to Major Adam on White River. I also sent back for provisions and for ammunition for the Hotchkisses. The day had been cold and raw and the night was bitter. Some men and officers had brought blankets; some had provisions and some had not. By dividing all had something to eat, and water was obtained by melting the ice which had frozen to the bottom of most of the water holes. Where there was any left it looked like pea soup and tasted like a dose of salts. We cut holes in the ice but the horses would not drink the water, even when they could be induced to approach them. Next day, however, they were glad to get any water, some of them slipped down on the ice and drank while lying by the holes. We spent our Christmas eve standing, sitting and lying around the fires, sleeping from time to time till wakened by the cold. I had sent no orders to the Artillery when sounding “boots and saddles.” It had no pack mules for carrying the guns or ammunition, but Lieut. Cronkhite hitched up and came along all the same, with only seven rounds. His shaft connections had broken, nuts had come off, etc., but he had rawhided them up and followed along the trail chosen only for Cavalry. During the night I had learned from Mr. Reed, who had come along as a volunteer guide and was the only man who knew the country properly, that these two trails came together near Bull Creek, ten miles to the northward and towards Big Foot’s country. I therefore, in the morning, divided my command into two parts, sending one under Lieutenant Colonel Morrow, along the western trail, while I took the eastern till we joined at Bull Creek. There was a point of the wall still further east called the Pinnacle, from which I was told the country could be viewed for thirty miles further, to which I sent two officers with a small party, but they could see no Indians. Arriving at Bull Creek at noon I examined the crossing and the valley above and below, there were no signs of Indians and no water. This was less than forty miles from where Deep Creek enters the Cheyenne, and which point, according Sumner, Big Foot had left three days previously, he therefore could not be coming toward me, and I started for my camp, arriving some time after dark, and having traveled over seventy miles since ten 0’clock of the day previous, and myself and command spending Christmas differently from most of our friends. I tried to write a report but could not keep awake and went to bed, and had my first six hours unbroken sleep since the night of November 22. The General commanding did not know where I was and sent me no dispatches that night. About this time I established a heliograph line to Rapid City with only one intermediate station, but there was so little sunshine that but few messages passed over it and it resulted in the loss for a considerable period of the service of 1st Lieutenant Dravo, and about a dozen soldiers which included nearly all the expert signalers, as I was ordered to leave the party with the heliograph line on Rapid City. The whereabouts of Big Foot’s band was (December 26 to 28) still unknown. Sumner’s scouts were totally unreliable, but I heard reports of Big Foot’s passing southward to the east of Mexican Ed’s which is a ranch on one of the heads of Bad River near where the roads from Laramie, Deadwood and Rapid City join going to Pierre. That “Deadwood and Chamberlain Road” so prominent on the maps, and so frequently mentioned in the dispatches, it is not a travelled road at all but a line which was reconnoitered for a railroad which was never built. It was most embarrassing to receive orders to cover that road and have the troops find it necessary to go many miles around to get a point near it. The guides I had knew little or nothing of it, and were bewildered when I talked to them about covering it. Major Adam in order to reach the point on White River called “Bear in Lodge” or “Bear runs under the lodge” had gone a little east of south on the Valentine or Porcupine road, then southeast down to Cottonwood, and then northeast down White River, making the distance about twice what it would be in a straight line. All other roads east of Cheyenne were similarly obscure and the guides being cowmen and boys with little use for wagons, had not noticed them much and knew but little about them. I kept troops out daily scouting up and down the Cheyenne and to the eastward and south eastward. Sumner and Merriam had orders to follow Big Foot closely and join me, but those orders appeared, from such copies and reports as I saw, and the results, to have been partly ignored, and partly countermanded. Col. E. A. Carr, Commanding Mouth of Rapid Creek, S.D. Sir: The Division Commander directs that you leave two troops to continue the examination of the bad lands for any Indians that may be hiding, or arms cached, and move with the balance of your command tomorrow morning towards White River, to arrive on that river between mouth of Porcupine and Wounded Knee Creeks not later than the evening of Tuesday the 30th instant. Sending word to the Division Commander at Daly’s Ranch to-morrow night, where your headquarters will be at that time, and on the night of the 30th make your Headquarters at the mouth of Wounded Knee. The Division Commander will be at Daly’s ranch tomorrow night and will camp on White River at crossing of Flour road next night. Send report to last named place, of your movements and position. Direct the two troops left in the Bad Lands after completing of their work to rejoin your command. 1st Lieut. 1st Infantry, Aide-de-Camp. The transportation was insufficient and I had to leave a lot of grain with a guard under Lieutenant Nickerson, 17th Infantry, but I got off pretty early, and, marching till long after dark, camped at the mouth of Cottonwood Creek, passing Major Adam’s battalion which was at Cottonwood Springs. This was my first camp on the Pine Ridge Indian Reservation, and was at the house of a squaw man or half breed who had hay and fuel, a cooking and heating stove, bureau, mirror, tables, chairs, bedstead and a melodeon. I was struck with the constant evidence of improvement and comfort of the Indians from here on, and, particularly along Wounded Knee Creek, which is a most beautiful stream of clear good water with frequent springs along its banks. It has the peculiarity of rising in night and falling during the day several feet, so that my men complained the first night that there was no water. It was then quite difficult to water stock or even to dip up water on account of its shallowness and of the ice. I had campaigned in that region fourteen years previously when there was no sign of civilization. Now there were wire fences, mowing machines, horse rakes, plows, barrows, wagons, stables, sewing machines, washing machines, etc. I found all the hay I required for 800 animals, for over two weeks, besides plenty of beeves, a milch cow and several broken horses. There was a church and school-house in the valley, (The latter had been burned) but there were fifteen or twenty houses in sight of it. The houses and doors, windows, stoves and furniture provided by the United States. All were abandoned and had been more or less plundered. December 29, I received information of the 7th Cavalry affair at Wounded Knee, both from General Miles and Major Henry. I marched up White River and encamped as ordered, at mouth of Wounded Knee, being joined en-route by Major Adam, and passing where Major Henry’s fires were still burning. Major Emil Adam, Sixth Cavalry, is entitled to great credit for his management during the detached service with his battalion from December 20, to 30, which contributed materially to prevent the junction of Big Foot’s Band with the other hostiles. I was informed that Major Henry, who had four troops Ninth Cavalry, intended to encamp twelve miles up Wounded Knee Creek, and to open communication with him. I detailed Sergeant McTague, with six men on the fastest horses. He started about an hour by sun and I did not hear of him again for several days. Two Indian Scouts came in with dispatches from Pine Ridge who said that they had met Indians on the road, and had been obliged to make long detours. When Sergeant McTague returned, he reported that he had travelled up the valley more than twelve miles without finding Major Henry’s camp, but continued on, as he was satisfied that he could perceive the tracks of his horses and wagons, though it was after dark; that during the night he saw two parties of Indians around fires, and charged them and they scattered in the brush. He went on to Pine Ridge, arriving in the forenoon after Major Henry whose wagons had been attacked by Indians. Sergeant McTague reported to General Brooke, who kept him for a day and then allowed him to return with dispatches. His was the only small party which traversed the Wounded Knee road. This gallant and faithful sergeant was within a few months of his retirement for thirty years of faithful service, but has since died of pneumonia contracted in the bitter weather since the close of the campaign. On the afternoon of January 1, 1891, my Saddler Sergeant McGrath who was in charge of the men at my regimental headquarters told me that he heard firing up White River. Captain Kerr’s troop K, was in that direction and I ordered Major Tupper to saddle up the other two troops of his battalion, to which Kerr belonged, and re-enforce him. I then ordered two troops of Major Adam’s battalion, A, and H, to saddle, and, upon receiving a message from Captain Kerr by two of his men, who were greatly excited, I proceeded with the latter two troops at full speed to the scene of action, which was not far from the mouth of Grass Creek, where a road crosses White River towards their stronghold. I found the Indians retiring, though still firing, and pursued them for some distance towards their camp, when as night was falling and they were fully repulsed and the policy was not to bring on an engagement, I returned. They had probably come out with the intention to break through our line to their old stronghold on the mesa of the Bad Lands, but were defeated and driven back, and made no other serious attempt. I commend Major Tullius C. Tupper, Sixth Cavalry, for activity, energy and bravery; Captain John B. Kerr, Sixth Cavalry, for coolness, ability and bravery; Captain William H. Carter, Sixth Cavalry, and 1st Lieutenant George H. Sands for the same. See my letter of February 2, 1891, recommending these officers for brevets. 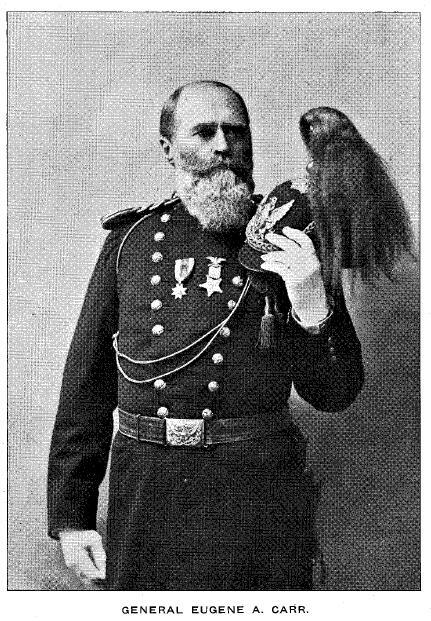 Lieutenant Sands is also entitled to credit for his performance of quartermaster’s duty while outfitting at Rapid City and at the mouth of Rapid Creek December 8, to 25, 1890. I have forwarded recommendations for medals of honor for Captain J. B. Kerr, 1st Lieut. B. H. Cheever, Sergeant Myers, Troop K, and Corporal Cornelius C. Smith, Troop K, and for honorable mention of 1st Lieutenant B. H. Cheever and the fourteen men of his platoon. Corporal Keiser, Troop — who is a medalist for carbine sharpshooting, was with my headquarters party and put in some accurate shots. He showed coolness and bravery and should have a medal. I had previously an understanding with him and the trumpeter Van Kelst of Troop K, because of treachery while I might be negotiating with Indians, I was to order Van Kelst in French to sound “Commence firing” so that they would not understand till they heard the signal, and Corporal Keiser was to kill the Chief instantly. The number of Indians was variously estimated from fifty to a hundred and fifty. Several were seen to fall, three were seen dragging off the body of one and one body was secured also three saddle ponies. We lost one horse killed and one wounded, for the next two weeks we were actively engaged in scouting against the hostile Sioux, whose camp was on or near White Clay Creek about twelve miles from mine, the object being to prevent them from going north or east and to constantly press them toward the agency. We saw some of them nearly every day and satisfied them that there was an efficient cordon around them. General Brooke visited my camp January 3, and stayed over night His Headquarters was near the mouth of White Clay. My line was from the haystacks below mouth of White Clay, on White River, to Whitney’s camp on head of Wounded Knee, about forty miles to guard with about 500 men. I still had Captain Cyrus S. Roberts, Company I, Seventeenth Infantry, which was most useful and I am greatly indebted to him for assiduous and cheerful attention to duty. The two little Hotchkiss guns might be useful in case of a battle, but could not help in scouting. The Cheyenne Scouts which finally arrived were newly enlisted and undisciplined. They were inclined to loot the abandoned cabins, to pick up ponies, kill cattle and otherwise to act according to their own sweet will. On the 12th of January, while scouting on Grass Creek toward the hostiles who were moving their camp up White Clay, while our camp was also moving up Wounded Knee, the interpreter came from the right and reported that the Cheyennes said “Indians are fighting soldiers in that direction” pointing to the southwest, which was where the troops with General Brooke were expected to be following the hostiles up White Clay. I was trying to find a place to water where Grass Creek was not frozen, but went at full speed in the direction indicated. I had Perry’s battalion with me and sent word to Tupper and Adam saw me galloping from seven miles off, and they all hastened to join me, but when we reached the Cheyennes, who had continued scouting to the right, they said they had sent no such message. Then I told him (interpreter) to tell them to guide me to the camp on Wounded Knee, and he pretended to do so, but they soon disappeared and I was obliged to guide myself by taking the direction. It was a most disagreeable, bleak, cold and sleety day and there were many trails which crooked and turned in the broken Bad Lands, making it hard to keep the points of compass. We were thoroughly chilled when we reached camp about dark, but Roberts had made a most judicious selection, had all the tents pitched, fuel ready, etc., and we were soon comfortable. On the 14th of January I received order to move a battalion to the beef corral on Wolf Creek, near Pine Ridge Agency. I had Reveille at 4 o’clock, but it was so stormy and dark that we could not see the roads till 7:15 and then the guides took the wrong one, which I corrected. After a most bleak and disagreeable march we reached the beef corral, designated, where we found Captain Whitney, 8th Infantry, who had just arrived, and went into camp with us. The Indians were then in sight streaming along up White Clay beyond the agency. My two other battalions arrived next day. My camp was along the north side of Wolf Creek on high ground sloping to the southwest, facing the Indian village, which was about three miles distant. The Indians gradually made up their minds to a complete surrender and commenced to give up their arms, and on the 23rd of January forces were assembled for the grand review of January 24, at which I commanded the Cavalry Brigade of about 1,500 men, and on the 26th took advantage of my leave of absence. My regimental headquarters and six troops were assigned to Fort Niobrara, Neb., with orders to move when the last of the Brules had started for their homes. The other three troops were assigned to Fort McKinney, Wyo. Both, as I have since learned, suffered greatly from blizzards on their marches, and upon arrival found their new posts not so good as Fort Wingate or Stanton. In writing this report I have been obliged to rely to a considerable extent upon my memory, and may hereafter wish to supply omissions or make corrections. I desire here to express my obligations to my regimental staff officers, 1st Lieutenant Frederick G. Hodgson, Adjutant and John M. Stotsenburg, Quartermaster. Lieutenant Hodgson, although new to the difficult and onerous duties, brought great intelligence, assiduous attention, patience and good temper to their performances. He was always ready, prompt and cheerful. Lieutenant Stotsenburg, a most accomplished staff officer, established soon after he joined, order and system which insured the obtaining of abundant supplies, both of quartermasters and subsistence stores. They were both on the field during the fight of January 1, 1891 and showed coolness and bravery. Eugene A. Carr, Colonel 6th Cavalry. Adjutant General’s Office, Official Army Register for March 1891, (Washington: Adjutant General’s Office, 1891), 69, 274 and 296. William F. Kelley, Pine Ridge 1890: An Eye Witness Account of the Events Surrounding the Fighting at Wounded Knee, edited and compiled by Alexander Kelley & Pierre Bovis (San Francisco: Pierre Bovis, 1971), fold out map attached to back of book. Photograph of General Eugene A. Carr from USMA AOG, Forty-second Annual Reunion of the Association of Graduates of the United States Military Academy at West Point, New York, June 12th, 1911, (Saginaw: Seeman & Peters, Inc., 1911), 99. John R. Brooke, Sioux Campaign 1890-91, vols. 1 and 2 (Philadelphia: Historical Society of Pennsylvania, 1919), 1054-1067. These documents were typed and certified as true copies by 1st Lieut. James T. Dean who served as aide-de-camp to General Brooke from February 1893 to May 1895. These original certified copies appear to have been bound into two volumes and an index likely by Lieut. Dean during that same time frame. A label in the front of each volume indicates that they were presented by General Brooke to the Historical Society of Pennsylvania on 21 May 1919. A select few of these documents–145 of over 1,080 pages–are also available online from the Historical Society of Pennsylvania under the title, “Correspondence, Sioux Campaign (vol. 2),” (http://digitallibrary.hsp.org/index.php/Detail/Object/Show/object_id/2392) accessed 8 Sep 2015. By the fall of 1891, Brigadier General Brooke was no longer the commander of the Department of the Platte, and thus, did not submit an annual report that included his previous department’s actions during the campaign. Had he done so, his report almost certainly would have included Colonel Carr’s report. 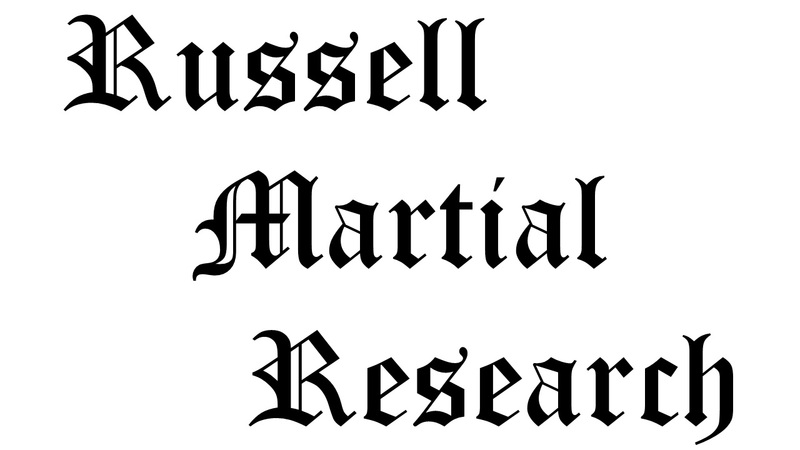 Citation for this article: Samuel L. Russell, “Colonel Eugene A. Carr, 6th Cavalry, Commander’s Report of the Campaign” Army at Wounded Knee (Carlisle, PA: Russell Martial Research, 2015-2016, http://wp.me/p3NoJy-Ng) posted 4 Oct 2015, accessed date __________. This entry was posted in Officers, Official Reports and tagged 1890, 1891, 6th Cavalry, Eugene A. Carr, Grass Creek, Medal of Honor, Pine Ridge Indian Reservation, Sioux. Bookmark the permalink. Larry… Thanks for commenting and glad that you found it informative. Hi Sam— I’m just back from eleven days on the road and pretty worn out. Thanks for sending the Carr material. This is so important, and I could never find it, even though I spent three days going through the Brooke materials in Philadelphia. I’m glad to have it, and wished I had turned it up, but somehow did not come across it. (I used materials from Carr that I found at USAMHI.) You’re a terrific sleuth! Jerry… The Brooke documents were a gold mine, of military records, many of which were not included in the Official Correspondence, &c. and NARA. Carr’s report was toward the end of the 2nd Volume. I was able to get photographs of a number of the documents, but am planning to go back to get the rest. I focused on capturing images of documents rather than reading them during the day I was there. I’m still going through them. I had never seen Brooke’s campaign report either, which I’ll reproduce in a later post. His records may be my next compilation for publication. Layton informed me that the OIW annual assembly will be in Pittsburgh next spring. Hope to have the opportunity to finally meet you there.